The Law Office of Stephen A. Black, P.A. "Justice consists not in being neutral between right and wrong, but finding out the right and upholding it, wherever found, against the wrong." 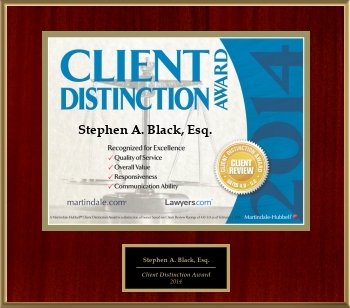 Stephen Black has been practicing Personal Injury and Immigration Law in Florida for more than 25 years. All Injury cases are handled on a contingency fee basis. This means that Clients do not pay Lawyer anything. Lawyer only recovers a fee if a settlement or verdict is procured. I will handle your case from start to finish; it won't be passed from associate to associate like at some larger firms. I handle only a manageable number of cases at any given time and I don't accept every case that walks in the door. This gives me the time to treat each case like it is my most important case. Following this business model has allowed me to recover millions of dollars for my clients. Mr. Black also practices Immigration and Consular Law. My office has successfully represented individuals and their family members from all over the world in obtaining Lawful Permanent Residence status either here in the U.S. or through a U.S. Consulate abroad. We will carefully analyze the facts of your case based on our extensive legal knowledge and experience, and will help you understand your options. Content copyright . Law Office of Stephen Black. All rights reserved.